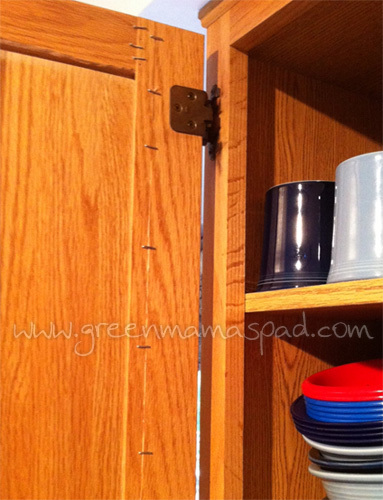 You know it is time for a kitchen makeover when your cabinets are now being held together by staples. Yes, staples. The other night after the kids were in bed I was relaxing on the couch watching some TV and my hubby was in the kitchen. I heard him go to the basement then come back up but I didn't pay much attention to what he was doing. Then all of a sudden I heard a loud noise - the staple gun. 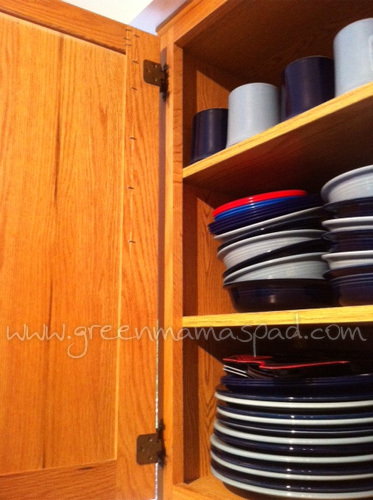 A few months back one of our upper kitchen cabinets started to split. I guess it must have been growing so he broke out the staple gun. Thankfully you cannot see them from the outside. Though I o giggle every time I open the door and see them. I would love to redo our kitchen someday. I just wish I could get that darn money tree out back to bloom so we could redo the kitchen. What room in your house could use a little TLC? Right now I'm giving TLC to my son's toy room... Once it's organized and neat, I think it might be a little better to keep him, well, contained! Ummmm... every room!! lol A handy man hubby, I do not have!